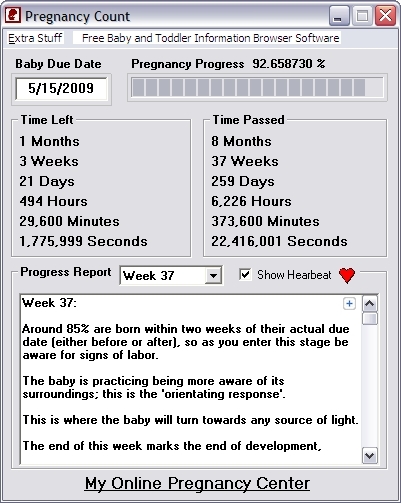 Pregnancy Calendar Software for windows includes a countdown timer and tons of pregnancy and baby information. If you are expecting then this is a must have program to keep track of your pregnancy week by week and see where you are in your stage of pregnancy. Just enter your pregnancy due date and the pregnancy calendar program will take care of everything else. ...... There is also a link to tons of searchable pregnancy information in case you have a pregnancy question. Once you have your little bundle of joy you can use the links to Baby and Toddler information to keep up to date with any questions you have about your new baby boy or girl.you have about your new baby boy or girl. Qweas is providing links to Pregnancy Count 6.0 as a courtesy, and makes no representations regarding Pregnancy Count or any other applications or any information related thereto. Any questions, complaints or claims regarding this application Pregnancy Count 6.0 must be directed to the appropriate software vendor. You may click the publisher link of Pregnancy Count on the top of this page to get more details about the vendor.